Faster and with greater capacity. 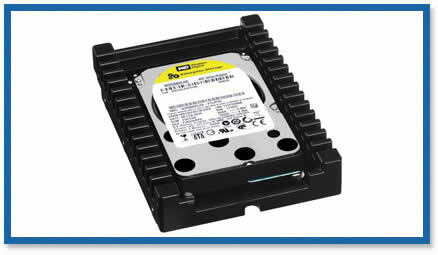 VelociRaptor Western Digital are traditional hard disks (it means magnetic) that have been in the market for some years. They have been always characterized for being faster than normal, largely because of the faster rotation speed of the disk, to 10,000 rpm instead of the 7,200 or 5,400 rpm. Today, according to what was expected, Western Digital has announced new WD VelociRaptor models that not only increase the capacity up to 600GB but also have the last version of SATA interface -SATA Gbps- and duplicates the previous limit of the SATA2. In the case of the WD VelociRaptor, they followed the same idea than previous models: hard disks of 2.5 inches but that are usually used with a mounting frame, the IcePack, that sometimes is used as passive cooler, and that also has a 3.5 inches size, ideal for home desktop computers or more developed computers (workstations or serves). According to WD, the new unities are 15% more powerful than the previous models. The Western Digital VelociRaptor models have a capacity of 450 and 600 GB, both with identical specifications including SATA 6 Gpbs.